When I started IntMath.com in April 2005 (it was in various forms before that), I was motivated by a desire to see more technological approaches in the teaching and learning of mathematics. Many students see math as calculation drudgery, however it can be - and should be - much more interesting and useful than that. At first, I used Flash and LiveMath to develop interactive math applets, but both of those technologies have gone the way of the dodo, and now I'm developing in javascriopt only. Thank you to all my loyal readers through the years, and I hope everyone will enjoy the ride as much as I am! There's some interesting mathematics behind hyperbolic discounting, a behavioral finance concept. Here's how it compares to exponential discounting. Here are some interesting things I've come across recently. This Inverse Symbolic Calculator is like a search engine for numbers with long decimal representations. It will give you a likely source for the number. The calculator correctly identified this to be the expansion of 2/π. This can be useful (for example) if you can calculate a value numerically, but need to know the function (or likely functions) that are behind the number. Here's a versatile online grapher: GraphFree. You can produce implicit, polar, parametric, piecewise, slope field and x-y scatter, as well as ordinary explicit function graphs. Output is given as an image, which you can copy and paste to your own document. Use the online keyboard (real keyboard entry other than numbers may give error messages). WIRIS is an online calculator with graph capability. It also handles calculations in polynomials, statistics, linear algebra and calculus. You can save your calculations (and graphs) to Google Docs for later use. Go here for documentation. The Story of Mathematics gives consise summaries of the major players in the history of mathematical development. There are plenty of explanatory diagrams making this a useful resource for getting an overview of the contributions by important mathematicians. The puzzle in the last IntMath Newsletter asked about a diagram that suggested the value of pi was 4. Here's another way of looking at that pi problem. If we do a similar process, but on the inner square, we find it has width around 0.707 and so giving a first estimate for pi as 2.828. But if we push the middle half of each side out as shown, we get a perimeter which suggests pi is greater than 3.14! Of course, the limits from each side should approach the same value. Hence the thinking is flawed. Here's how it should be done. Our initial square should have been broken up so the sides are tangent to the circle, using regular polygons with increasing numbers of sides. In the following diagram, I've constructed an octagon around the outside of the circle, and this gives an approximation for pi of 3.3137. In the one on the right, I've found the perimeter of the inner octagon to be 3.0615. If we create polygons with increasing numbers of sides, the outer and inner perimeters will tend to the known value of pi. This is similar to the approach taken by Archimedes around 250 BCE. (He was actually looking for the area of the circle.) There's a neat interactive on this page showing what Archimedes did: Approximating Pi. We have three points P, Q and R on the co-ordinate plane at (0, 8), (6, 0) and (x, 12) respectively. If 0 < x < 6 and area ΔPQR = 20 unit2, what is the value of x? I've lived in Singapore now for nearly 20 years. It's a great place to be a teacher, since education is taken seriously and given the resources needed to produce (generally) good results. The current prime minister is a mathematics major (a rarity among world leaders). The "founding father" of Singapore, Lee Kuan Yew, passed away last week. While his policies were often criticized in the West, he was responsible for producing a successful small country, where racial and religious harmony is a top priority, where there is full employment, high national savings and little debt, and which for the most part is safe, clean and green. Here is LKY's thoughts on teaching. Thank you for ten years on the Internet with your free, innovative math website. Murray, can you change the infinite repeating bimal ,010010010... to a non-binary fraction? Does that make sense? This reduces to 4x=8, where x=2. Any chance you could incorprorate LaTeX in the comments sections? Would be super cool! The area of a triangle is the distance between a vertex to a segment times the length of that segment divided by two. x = 5.5, which fits the constraints! 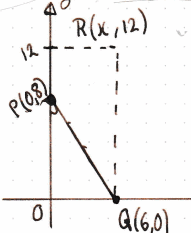 Let vectors to (0,8), (6,0), and (x,12) be P, Q, and R, respectively. 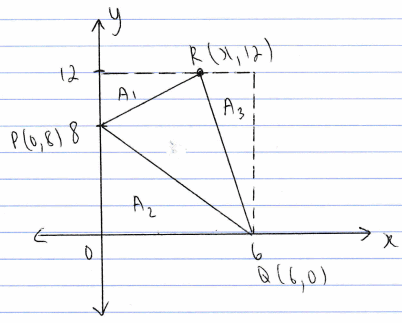 The area of the PQR triangle is half the parallelogram formed by vectors P - R and Q - R, i.e. these vectors form adjacent sides of the parallelogram. the triangle lies in the rectangle with area 72. the value x is obtained by subtracting the areas of the other triangles inside the rectangle where the equation 72-2x-6(6-x)-24=20 applies. and x=2. Using the determinant method, we can find the value of x.
area = 0.5 |D|, and solve the equation 0.5 |D| = 24 for x. The solution is x = 3. To find x we will find the parallelogram that contains 2 × ΔPQR. First we'll find the base of this parallelogram or PQ. We know this parallelogram has area 2 × ΔPQR = 40 units2. The area of a parallelogram = bh. 40 = 10h or h = 4. We now know there is a parallel line 4 units away from PQ that forms the other side of the parallelogram. We can find a point on this new line being 4 units away from Q.
because arctan(3/4) is the angle between the x-axis and the perpendicular line, of length 4, from PQ. Because PR makes the sides of the parallelogram, this new line also passes through R.
It is very interesting to see so many ways that were used by the participants to reach at the solution.